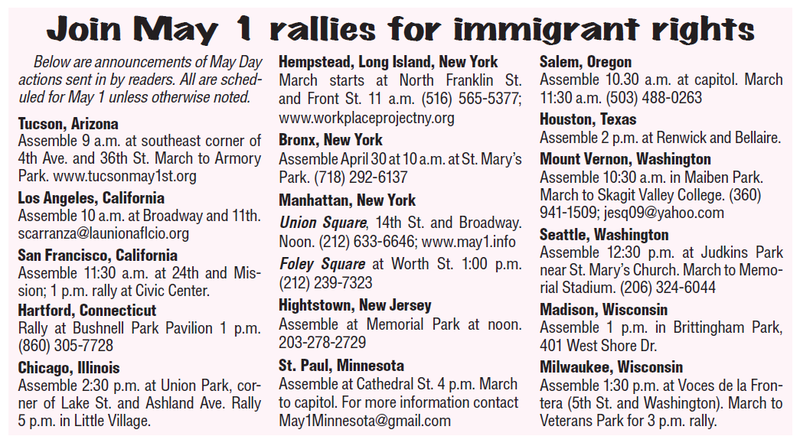 Activists and others who support the struggle for democracy taking place in the Middle East, those who oppose US support for the intervention in Bahrain , opponents of US and NATO military intervention in North Africa should join this coming Sunday May 1 for May Day rallies supporting the social and human rights of immigrant workers in the United States and for the rights and standards of living of all working class people. Details and locations can be found at this page on my blog. This entry was posted in Bahrain: International Support, Labor Movement, Migrant Labor, political mobilizations. Bookmark the permalink.